Are you constantly chasing down notes and scribbles from random pieces of paper? Do you look at your notes and wonder what your last scribble was and why? Do you have so many notebooks going at once that you are constantly misplacing your “working” notebook and starting a new one? If you answered yes to any of these questions, or if these questions got you thinking of a multitude of other problems when it comes to taking notes, then you should consider using Microsoft OneNote. OneNote is a robust note taking software. Take notes on the computer, scan hand written notes, or simply take a picture of your notes – it doesn’t matter, OneNote will capture and organize them all. You can also share your notes with your team for collaboration. OneNote allows you to share both online and across your network, allowing you maximum flexibility for collaboration. OneNote is setup to look like a virtual notebook. You can create tabs to separate and organize sections. You can even create new notebooks for different types of work, allowing you to easily organize your items to ensure nothing is lost. Additionally, OneNote has a host of fantastic features, making it easy to access and organize your notes, so you never miss a task or project again. Anything you put into OneNote is automatically saved, without you having to do anything. This is a great feature when you’re in hurry, or when an emergency happens, like a power outage. OneNote has a built in OCR for scanned items or photographs, allowing these types of items to be easily searchable and editable. Collaborate across the web, or across your network. OneNote allows you to work with others on projects and notes. OneNote allows you to track changes, so that you can easily see who has edited / contributed the notes. You can even password protect tabs, keeping sensitive data safe. You can use OneNote from your computer or your mobile phone. OneNote has an app for windows-based phones, android phones, and iPhones. The app is free for the first 500 notes, after which there is a one-time fee of $4.99. OneNote is cross-compatible with Microsoft Outlook, allowing you to send emails, tasks, and events into your notebooks with a click of a button. Want to start using OneNote? It’s available with most of the newer versions of Microsoft Office, so see if it’s already installed. 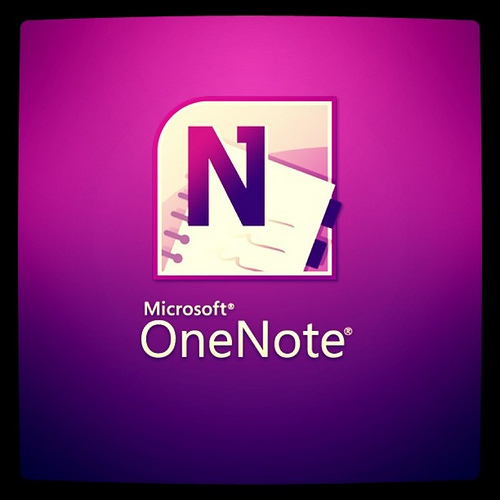 Or, you can download a free trial of OneNote from Microsoft here. A full license is available for $100. Do you use OneNote? Leave us a comment and let us know what feature you use the most. Julie Strier is a freelance writer who is interested in helping you find smarter ways to use your software. Email: julie@mybusinesswriter.com. Website:www.mybusinesswriter.com.